The Cubs have agreed to a minors deal with righty Colin Rea, Matt Eddy of Baseball America reports on Twitter. Details otherwise remain unclear. Now 28 years of age, Rea at one point seemed likely to be a steady rotation piece at the game’s highest level. In fact, the Marlins acquired him on just that premise in the middle of the 2016 season. Things took a stunning turn when Rea exited his first start in Miami with an elbow injury, teeing up a controversy with the Padres that resulted in Rea being shipped back to San Diego. Rea ended up undergoing Tommy John surgery not long thereafter, costing him all of the 2017 season. Though he returned to the hill last year, Rea managed only a 5.73 ERA in 75 1/3 innings in the upper minors. The San Diego club dropped him at the outset of the offseason. He’ll look to get back on track in Chicago and perhaps provide an interesting depth option for the Cubs. Also joining the Chicago organization is outfielder Zach Borenstein, Eddy adds. The 28-year-old has yet to crack the bigs, but has posted some solid numbers at times at Triple-A. In five total seasons there, he carries a .260/.337/.476 slash, popping 65 home runs but also going down on strikes 493 times in 1,657 plate appearances. The Rangers could elect to use a six-man rotation this year, but their best starter, Cole Hamels, isn’t on board (via Gerry Fraley of the Dallas Morning News). The 34-year-old southpaw opined Saturday that a six-man starting staff isn’t “appropriate for where I am at this stage.” Hamels also took a shot at the idea in general, saying: “It’s not part of baseball. I know that’s the new, analytical side, trying to re-invent the wheel. … that’s just not what MLB is to me. That’s not how I learned from my mentors. That’s not the way I’m geared to pitch.” Unfortunately for Hamels, manager Jeff Banister favors the six-man alignment and seems more likely than ever to try it this season, Evan Grant of the Dallas Morning News tweets. Regardless of how Texas’ rotation plans shake out, it’ll probably need a bounce-back year from Hamels to have any chance at a playoff spot. The longtime front-end starter endured arguably the worst season of his career in 2017, when he logged a 4.20 ERA/4.62 FIP with 6.39 K/9 and 3.22 BB/9 across 148 innings. The Diamondbacks are still determining their starting middle infield for 2018, Steve Gilbert of MLB.com writes. Either Ketel Marte or Chris Owings could start at second base or shortstop, while Nick Ahmed is also in contention – but only at short. “I’d say on that front, we value Nick as a shortstop,” manager Torey Lovullo said. “I haven’t had a conversation with him beyond playing shortstop at this point.” With the exception of an 11-inning stint at the keystone in 2014, his first taste of major league action, Ahmed has spent his entire career at short. He has dazzled defensively, evidenced by his 37 DRS and 19.6 UZR, but has only managed a .226/.273/.345 batting line in 1,020 plate appearances. The Padres have temporarily halted right-hander Colin Rea’s throwing program after he experienced soreness in his pitching shoulder Friday, AJ Cassavell of MLB.com reports. Rea, who’s working back from 2016 Tommy John surgery, is now unlikely to be ready for the start of the year, Cassavell suggests. Consequently, it appears he’s out of the running for a spot in the Padres’ season-opening rotation, though Cassavell notes that they still have seven other candidates for their starting five. Padres righty Colin Rea underwent Tommy John surgery yesterday, according to Dennis Lin of the San Diego Union-Tribune (via Twitter). Rea had been attempting to avoid the surgery with a platelet-rich plasma treatment and rehab, but the decision was made to go ahead after he felt discomfort after a throwing session. There had increasingly been hope that Rea would be able to return for the start of 2017, but the best case now is for him to make it back for the 2018 campaign. Of course, that would have been the expectation had he gone under the knife earlier, though perhaps now there’s a bit less wiggle room in his forthcoming rehab. 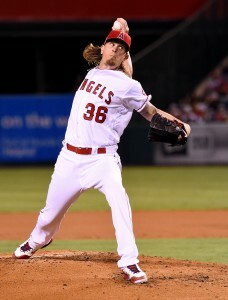 Initial reports were that he was destined for a replacement of his ulnar collateral ligament in the middle of the season, but that was re-considered — influenced, perhaps, by the progress shown by Angels righty Garrett Richards in a non-surgical approach. The 26-year-old’s situation was rather more complicated than that, of course. As has been discussed at length, Rea was sent by the Padres to the Marlins at the trade deadline in a multi-player pact. But he exited his first outing in Miami with elbow issues, teeing off a scandal of sorts that led to him being shipped back to the Padres. In related proceedings arising out of San Diego’s medical practices, club GM A.J. Preller ultimately served a thirty-game suspension for reporting issues that the organization has pledged to remedy. Without Rea, the Padres’ rotation needs are more evident than ever. San Diego already seemed a likely landing spot for an arm or two. Without expectations of contention, expectations are that the club may look into some riskier, higher-upside assets on this winter’s player acquisition market. Rea is set to reach arbitration eligibility before the 2019 season, so he’ll have a chance to post a platform year before hitting the arb cycle. Certainly, his earning opportunity will be limited by the inability to rack up innings in the second half of 2016 and all of 2017. The Padres will hope that he can return to health and improve upon the 4.69 ERA he posted over his first 134 1/3 major league frames. Preller further explained that the Padres are anticipating a busy winter. The GM noted that ten rival organizations have already “check[ed] in with us” on trade possibilities since he was reinstated. The trade market figures to be “fairly active,” he said, given the weak free agent class. The Padres parted ways with two coaches — Tarrik Brock and Eddie Rodriguez — but otherwise intend to keep their field staff in place, as Dennis Lin of the San Diego Union-Tribune reports. First-year skipper Andy Green will remain at the helm, with bench coach Mark McGwire, pitching coach Darren Balsley, hitting coach Alan Zinter, third base coach Glenn Hoffman, and bullpen coach Doug Bochtler all set to reprise their roles as well. Colin Rea, whose injury in his first start with the Marlins after a summer trade played a major role in Preller’s suspension, is still working toward avoiding Tommy John surgery. He recently completed a 40-pitch bullpen session, Lin notes in the above-linked post. The hope is that he’ll at least be able to partake in live BP sessions before being shut down for the winter, with some possibility he’ll even appear in AFL or winter league action. If all goes well, Rea will hold off on a TJ procedure in hopes of enjoying a full 2017 season.